Speaking from Harrisburg Monday afternoon, Wolf was surrounded by families and advocates eager to see the program take off next year. He assured them the state is on track to implement medical pot by 2018. “This is really a good bill. It’s being done the right way,” he said. Wolf did not single out any states in particular, but neighboring New Jersey has notoriously struggled with their program since voters approved it in 2010. The Garden State recently received a C-grade from Americans for Safe Access (or ASA) in their yearly report. The advocacy group concluded that Gov. Chris Christie’s anti-pot stance hindered proper implementation of the program, which has made it difficult for patients to access their medication. Under current regulations, prescriptions must be obtained from one of six licensed centers and just five are operating in the entire state. Only patients with qualifying conditions that are “resistant to conventional medical therapy” are eligible for the program. They must be re-certified by a licensed doctor every 90 days. Maryland also received a C grade. The state’s slow implementation has left patients without access to medical marijuana for years as dispensaries continue an uphill battle to open, according to ASA. The state does not explicitly allow patients to grow their own pot, leaving many people high and dry. Wolf anticipates no such problems in Pennsylvania. Despite his optimism, the Department of Health has declined to release information on how many applications from potential growers and dispensaries it has received. Rumors suggest up to 900 individuals or groups submitted applications at the end of March. The agency has also declined to give a timeline of when those numbers will be released and when people will be notified of their approved applications. “We know that the number one question on everyone’s mind is who applied for a permit and where are they looking to place a facility,” said Secretary of Health Karen Murphy. John Cohn is one of the people waiting to hear whether his application to grow weed in Pottstown has been accepted. Only 12 in the entire state will be granted. Despite the uncertainty, Cohn would have just six months after receiving his license to bring the cultivation site to life. “We had to lease property. We had to get zoning approval and [get] the capital,” he said. It’s an expensive gamble but one worth the risk, he said. His company, Agronomed Pharmaceuticals LLC, was formed after merging with another potential applicant, Keystone Medical Cannabis. It now comprises 23 owners mostly from Montgomery and Chester counties who provided a convincing argument for zoning approval in Pottstown: economic development. The company offered to share up to 5 percent of its revenue with the borough and provide as many as 80 new jobs. “[They] were very positive about us coming in,” Cohn said. 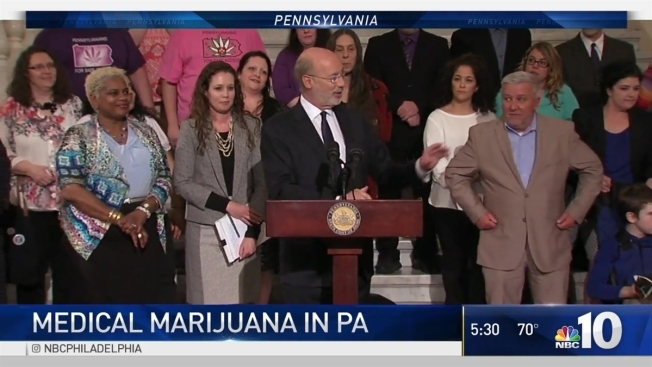 Meanwhile, officials throughout the state are bracing themselves for a potential political firestorm when Pennsylvania’s program gets off the ground. Federal Attorney General Jeff Sessions is an adamant opponent of marijuana. He has spoken against recreational cannabis and appears conflicted about medical pot. During his confirmation hearings, Sessions implied cannabis was only mildly better than heroin and then observed that “good people don’t smoke” marijuana. With that in mind, Pennsylvania Attorney General Josh Shapiro vowed to defend the state’s nascent program. “We’ll be overseeing it. Regulating it and ensuring that people handle both the dollars and cents and the marijuana in an appropriate way,” he said. Last week, the Department of Health invited physicians to provide feedback on proposed regulations for doctors interested in prescribing medical marijuana. The department has not disclosed how many physicians are interested in obtaining the necessary certification to participate in the program.